A tasty tropical dish. Great poolside, finger food for the kiddos, snack for a small crowd, or light appetizer for dinner. Make a huge batch and freeze to have them at the ready for any gathering. Suit up, it's frying time! 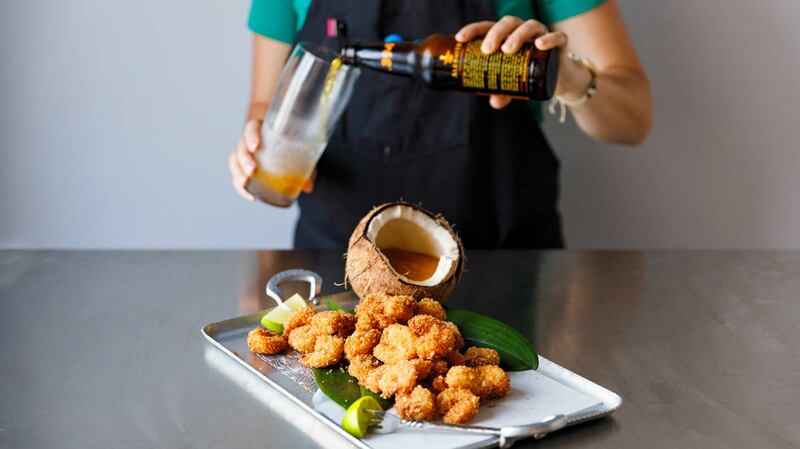 Besides the pineapple, here's what we'll need for the Pineapple Sauce that'll go with our Coconut Shrimp: Tangerine Artisan, Ginger Compound, one chopped jalapeño, a shallot (also chopped), pineapple juice, and a lime for juicing. Yum, we can almost taste it already! First we'll blend up the fresh chopped pineapple with the shallot, jalapeño, and pineapple juice. Blend, blend, blend until smooth. Bring the sauce to a boil, then simmer for 10 minutes before stirring in Tangerine Artisan and Ginger Compound and simmering another 5 minutes or until thick and saucy. Now's the time for lime juice and a pinch of salt. Yes, this recipe uses a LOT of bowls, but it will all be worth it we promise! We're flavoring the egg mixture with some Toasted Coconut Compound. 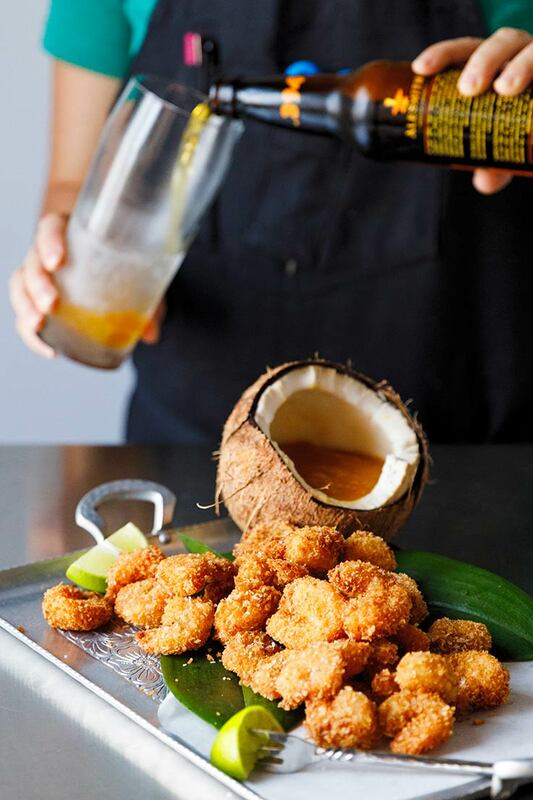 Floury shrimp get a quick dip in our flavorful egg mixture to help the coconut/panko mixture stick. 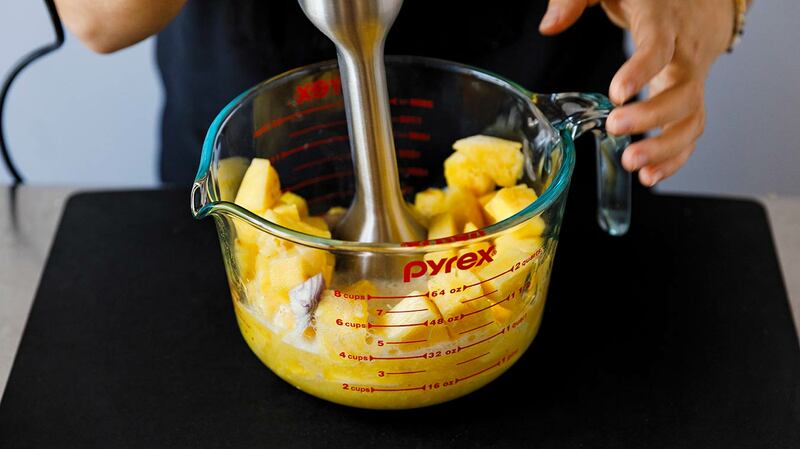 Blend shallot, pepper, pineapple, and pineapple juice until smooth. Pour in a pot and bring to a boil. Reduce heat and simmer for 10 minutes, stirring occasionally. Add Ginger Compound and Tangerine Artisan. Stir well and simmer another 5 minutes to a thick, saucy consistency. Add fresh lime juice and season to taste with salt. Let the sauce cool before using or refrigerate for up to two weeks. 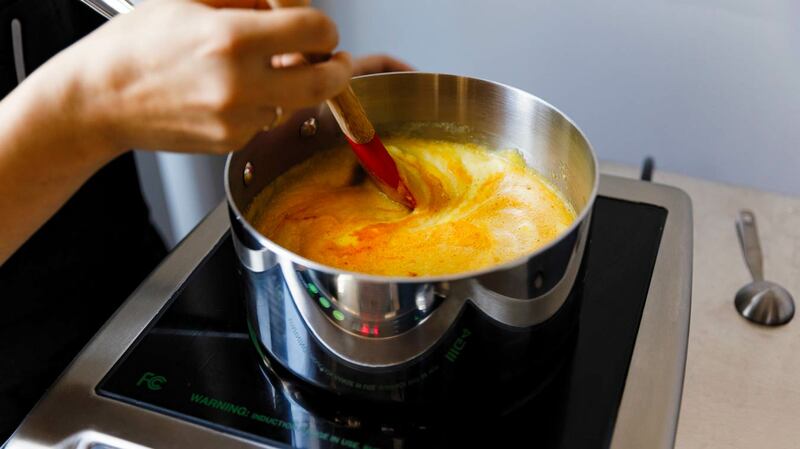 If frying immediately, go ahead and get the oil onto the stove or turn your fryer to 350°F. Keep in mind that oil expands as it heats up. It will also bubble up when you place the shrimp in it. Plan accordingly by using a large, deep pot that allows at least 2" of oil, with sides that come at least 3" above the oil level. Have a metal slotted spoon or spider (fancy term for skimmer) at the ready as well as a sheet pan lined with paper towels for absorbing any excess oil once your shrimp are done. Line bowl #1 with paper towels, put the shrimp on top so all excess water gets absorbed. Whisk the flour and dash of salt in bowl #2 and place to the right of bowl #1. In bowl #3, whisk eggs and Toasted Coconut Compound. Set beside bowl #2. Toss panko and unsweetened shredded coconut together in bowl #4. Set at the end of the line. 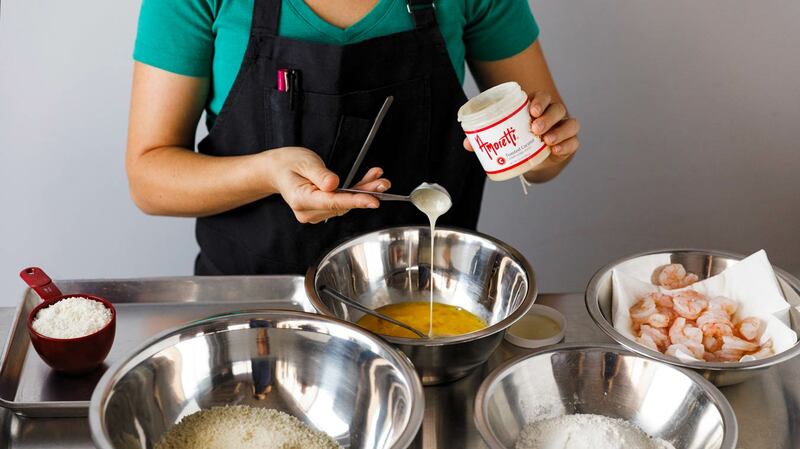 Take a handful of shrimp (bowl #1) and toss in the flour (bowl #2). Toss around until fully coated. Shake off the excess before dropping them in to the egg mixture (bowl #3). 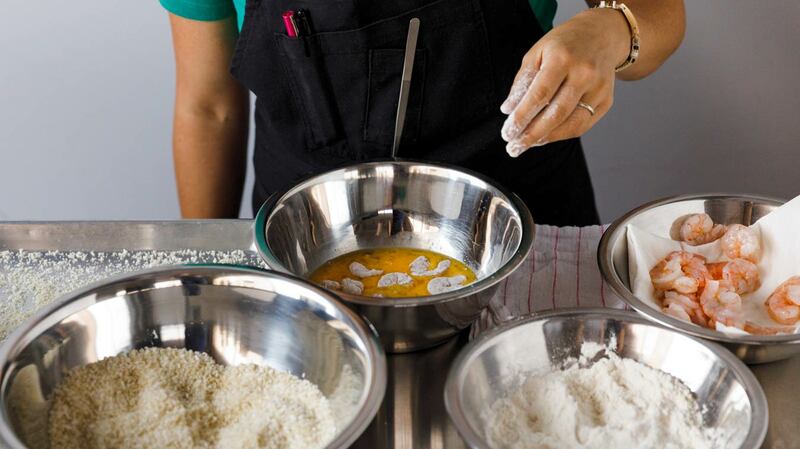 If the excess flour isn’t shaken off well, the egg won't fully coat the shrimp. Make sure each shrimp get fully coated in egg, allowing the extra egg to drip off. If there are any “bald spots” put it back in the egg and make sure it is fully coated. Place them in the panko (bowl #4) and coat them REALLY well. Press them into the panko mixture to ensure full coverage. Put them on the plate and repeat until all of your shrimp are breaded. At this point, you can cook them right away or wrap them up tightly, refrigerate, and cook them any time in the next two days. Pull them about 15 minutes before frying. If you are going to freeze them, let them thaw overnight in the refrigerator, they won't fry well straight from the freezer. Make sure that your fryer is ready and, if you are using a pot and thermometer, make sure your temperature is set and stabilized. Gently*** set some shrimp in the hot oil, the amount will depend on the size of your pot or fryer, not more than one shrimp deep. The temperature of the oil will drop as soon as you put a batch of shrimp into it. That’s okay! Don’t adjust the temperature. Just let it come back up to temp before you put the next batch of shrimp in. Cook until the bubbles have subsided and coconut has a nice toasted color. Check one for doneness right away, they should be 90% cooked through. They will be hot! Season with a sprinkle of salt straight out of the oil. Let them rest on a paper towel for a few minutes before enjoying, this will also give them time to cook all the way through. The frying oils we've recommended (grapeseed, canola, peanut, or avocado) are all readily available and have significantly high smoke points (i.e., they can withstand incredibly high heat without burning, around 400°F and above). What’s the deal with the number next to certain shellfish? 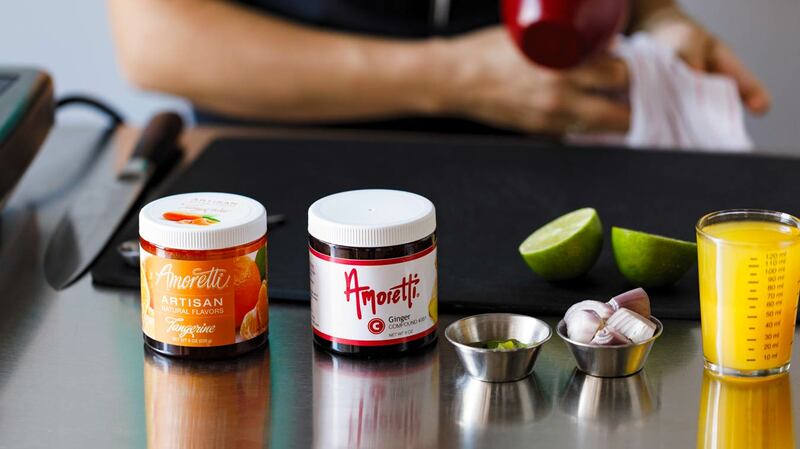 Seafood is packaged by size for the ability to have everything cook at the same timed. The number range that precedes the name of your seafood refers to how many individual pieces are in one pound. The higher the number, the smaller the size. For example: U10 scallops means you will find about 10 scallops per pound. 21/25 shrimp means that there will be 21-25 individual shrimps per pound. It is a great way to identify the correct sizes for cooking times and techniques in recipes. 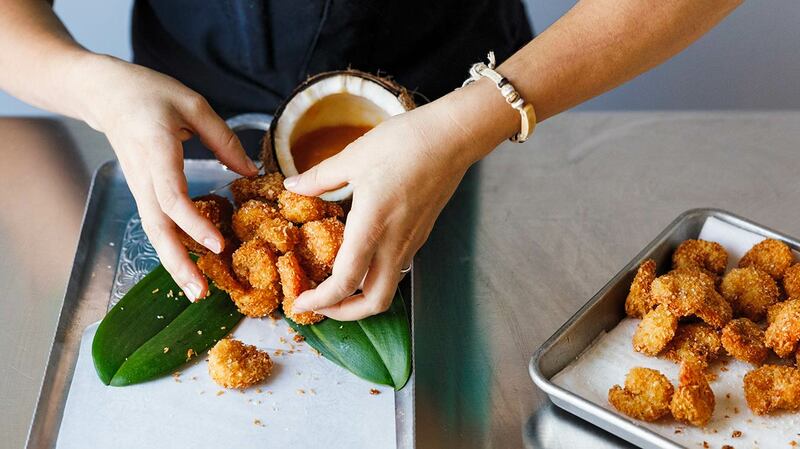 We chose smaller shrimp for this recipe for two reasons: perfectly poppable, bite-sized portions to make these easy for snacking, serving as hors d’oeuvres, or finger-food friendly for the kiddos; and so that the shrimp cooks all the way through just as the coconut toasts to golden brown perfection. This is where oil temperature is key. 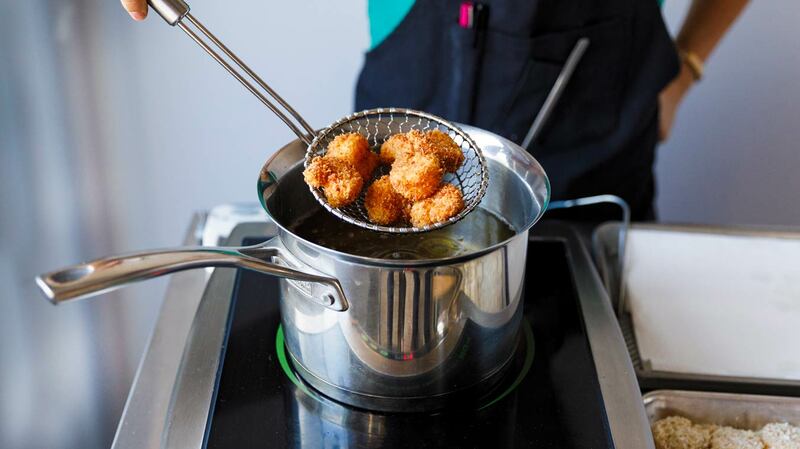 If you don’t have a home fryer, a tall pot and a candy thermometer are the perfect tools. ***Safety first! Contrary to what your instincts might tell you, the closer you get to the oil before letting go of the shrimp the better. Gently laying the shrimp in avoids splashing scalding hot oil. Dropping them in will result in a big splash and a big injury. If you don’t feel safe deep frying using this technique, use a sauté pan with half an inch of oil and turn them half-way through cooking. It won’t be as easy to control the temperature and you will have to really babysit the shrimp for doneness and make sure they don’t burn.